Skyscanner.net. Skyscanner is a favorite because of their consistently low prices. They generally offer the best deals by searching 6-8 airline providers at once. Kayak.com. Kayak offers great prices, and it’s also unique in that it offers multi-city travel searches. If you’re visiting two or three countries, you can book all legs of your trip in one purchase. Easy! AirAsia.com. A perennial favorite among expats in Korea. Kuala Lumpur, Malaysia is a hub for AirAsia, and they frequently offer special (super low!) prices on flights to other destinations. Many people book flights into KL from Korea, then fly to their intended destination to save money. Adioso.com. Adioso is a fun tool that lets you search using a variety of criteria. Wondering where you can fly from Seoul for under 500,000 Won? Want to go to Japan any weekend for 2 nights? Adioso is highly interactive and fun to use. It takes a minute to get used to it, but watch the tutorial and soon its user-friendly interface will have you planning trips all day. Peach Airlines. Peach is a low-cost Japanese carrier that operates regular daily flights to and from Korea. If you’re heading to any of nearly a dozen destinations in Japan, Peach is likely to have the best prices. Additionally, Cheapoair.com, despite their less-than-elegant name, has been a consistent winner for low prices for travel throughout SE Asia. eBookers.com is also a popular site. Obviously, these are only a small sampling of what’s out there. These suggestions are what works for us, and should be enough to get you started. Airlines: Though metasearch engines like Skyscanner represent most major airlines, there may be sales and promotions that their methods don’t take into account. Try browsing the metasearch sites for prices, then visiting the individual airline’s site to compare prices and search for sales and promotions. Airports: Incheon Airport is beautiful, there’s no doubt about that. It’s one of my favorite airports, and has won numerous awards worldwide. 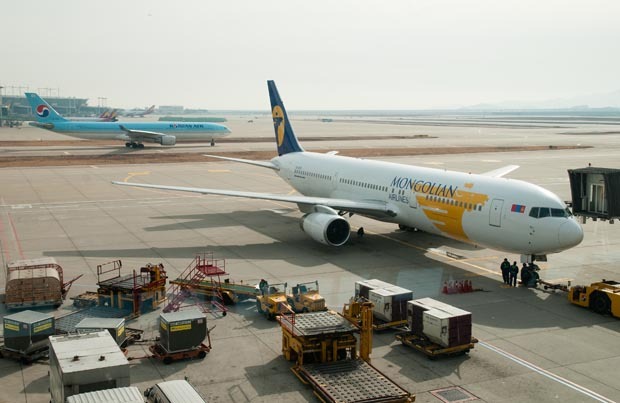 But Korea is home to several airports, many of them viable (and often cheaper) options for flying internationally. When selecting your departure airport, don’t overlook them! Check out Gimpo (Seoul), Cheongju and Busan. Depending on your priorities, you can save a lot of time or money by choosing one of these alternatives. Frequent Flyer/Mileage Programs: If you participate in any mileage programs, check the website for the airlines you’re booking to see if there are any partnerships between the two. For example, if you’re a Delta Skymiles member, you can earn points when you fly with Korean Air. Do you have a favorite site that we missed? Any tips or tricks that you’d like to share? Send us an email or leave a comment! Happy travels!